Portal dalje.com has passed on Croatian news agency HINA reporting: “The Croatian World Congress (HSK) has called on Croats worldwide to unite in a prayer “for justice” for six former heads of the Croatian Community of Herceg-Bosna for whom the International Criminal Tribunal for the former Yugoslavia (ICTY) will hand down its ruling on May 29, the media in Bosnia reported on Saturday. ‘We are confident that the thesis about a joint criminal enterprise is entirely unfounded, as it was unfounded in the case against Ante Gotovina and Mladen Markac. Every crime needs to be condemned, but calling defence a joint criminal enterprise and convicting Croats on this basis portrays all other Croatian soldiers and Croatia … in a negative light. We strongly oppose that,’ the HSK said. The ICTY is scheduled to hand down its ruling in the case Prlic & others on May 29. The ICTY prosecution accused the former heads of the Croatian Community of Herceg-Bosna – PM Jadranko Prlic, Defence Minister Bruno Stojic and the Commanders of the Croatian National Council (HVO), generals Milivoj Petkovic and Slobodan Praljak, HVO Police Commander Valentin Coric and the head of the Office for Exchange of War Prisoners, Berislav Pusic – of crimes committed in a joint criminal enterprise headed by former Croatian president Franjo Tudjman with the aim of ethnically cleansing the Herceg-Bosna region and annexing it to Croatia in an attempt to create a Greater Croatia. 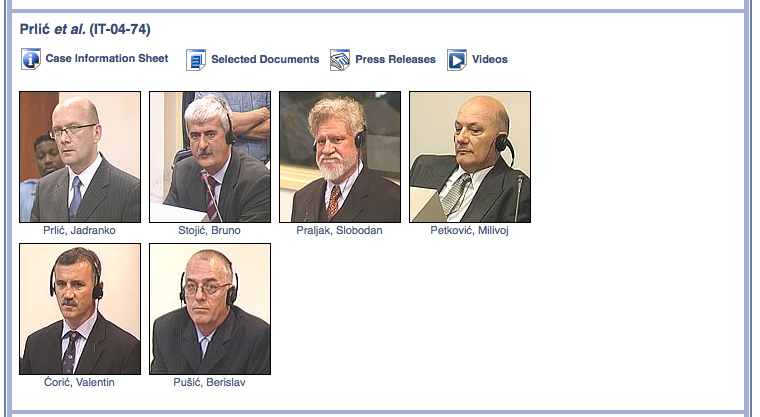 The prosecution asked for 40-year sentences for Prlic, Stojic, Praljak and Petkovic, 35 for Coric and 25 for Pusic. The defence argued that they be acquitted. The six gave themselves up on 5 April 2004. The trial began in April 2006 and is one of the longest running trials at the tribunal”. « Croatia: Marking Tito’s Birthday – “Tito thieved, but he gave some of the plunder to the people …”! Sometimes I wonder how we Croatians even get ourselves into this mess. It seems some people will stop at nothing to write history in a manner which suits them. I am not one for erasing the crimes that were committed and no one can deny that any side is capable of crime in a war, but like the Markac and Gotovina case, this has some very different connotations that come with a guilty verdict. I can only hope and pray for the best. Kat, I agree but we didn’t get ourselves into such mess it was Carla del Ponte who as ICTY Prosecutor concocted all sorts of terrible stuff by way of indictments. I would imagine that Stjepan Mesic has also a great deal to do with this when he decided to spread all sorts of lies and fantasies regarding Croatia & B & H relations during the war, not once in those moments consider the Croatian people who needed help desperately, but always considering how he could get Franjo Tudjman’s job by vilifying him. My comment probably wasn’t worded in the best manner, but don’t get me wrong, I don’t blame Croatian people themselves for getting us into this situation, at least not the ones who can see past the smoke and mirrors, the lies. It just seems like even after such sacrifices were made for freedom, we’re being dictated to and mislead by backstabbers, traitors, liars without any dignity whatsoever. (Mesic and del Ponte definitely come to mind). What did we fight for if our sacrifice is to be marked as a crime? What did we fight for when Croat-Bosnians are scattered all over the world, their hardships hardly recognised (apparently we’re not real Croats, but we’re not real Bosnians either so what are we?) with little chance of ever rebuilding the strong communities they once had, while Republika Srpska is in charge? How did we get to the point that liars and traitors were allowed positions of power and control so they could go about manipulating people, distorting facts and reality and driving us further into the ground? It’s disheartening, but I can only keep praying and hoping and being thankful people like yourself still exist. Kat, all understood and thank you. What’s happening in B & H is absolutely shocking and unbelievable. But, if we hang in there, in pride patience and hard work, good may yet prevail. It is interesting how Mesic’s, Pusic’s (both Zoran and Vesna), Terselic’s, Jakovina’s, Butkovic’s, and “big Croat” and NDH advocate Paraga’s take on the never-occured “Croatian aggression” against B&H – as well as their fables about the never-existent “deal” in Karadjordjevo (for which, unlike Izetbegovic’s emissaries’ signed agreement with Koljevic and Karadzic, the Historijski Sporazum of September 1991; and Izetbegovic’s deal dividing B&H and recognizing RS independence in April 1993, there is no signed document, let alone minutes) are 99.9% exactly the same as Serbia’s fascist wartime media apparatus’ and Serbia’s neofascist post-war media apparatus’ take on the war. Being that Col. Dr. Charles Schrader’s book The Muslim Croat Civil War in Central Bosnia 1992-1994 (http://us.yhs4.search.yahoo.com/r/_ylt=A0oG7oyj4aNRYgoAB3EPxQt. ;_ylu=X3oDMTBybnZlZnRlBHNlYwNzcgRwb3MDMQRjb2xvA2FjMgR2dGlkAw–/SIG=12t4i47hs/EXP=1369723427/**http%3a//www.amazon.com/The-Muslim-Croat-Civil-Central-Bosnia/dp/1585442615) was, as in the Blaskic case, barred from evidence (Schrader was contracted by the ICTY to research the Muslim-Croat conflict and his conclusions were the exact opposite of the prosecutor’s), we don’t have to even question just how “legitimate” this proceeding, and the case itself, was and are as the court decided that hearsay, conjecture, verbal gymnastics and cherry picking events (out of chronological order, and or skipping between years and even decades and centuries) were allowed by the prosecution. Praying for the best still. Ina, I think contacting Col. Dr. Schrader for an interview may be in order. Thanks Americro for the suggestion re Col. Dr. Schrader – will certainly get onto that. Praying for a just verdict of not guilty of joint criminal enterprise, clarity and decency of humanity and an end to the attempts at moral equivalence of aggressor and victim and collective guilt. Please Dear Lord and Jesus Christ and All The Saints Help our innocent Patriots who defended our Dear Croatia and Herceg -Bosna from evils to be found Innocent and Free! kat you made some very good comments as I been saying pretty much the same thing as both you and Ina. I also hope for a not guilty verdict. The only way I know to correct all that’s wrong with Croatia and its politics is to start getting people to move back and get involved. It is obvious that it is very hard to do so from a far. I can tell you first hand that the goverment does not want those who are not living in the country involved and they do everything they can to deny proper citizenship papers to anyone claiming to be a Croat.It really will take all of us to continue to chase our goverment until they give in and listen to the will of the people. We have given up way to much to this day and about to give up more with nothing to show for it. I only hope and pray that someday i can get the proper papers to live in Croatia so that i can at least go and live there and voice my opinions and run for office even if all I get to do is have a platform to help awaken the voices of those who feel left behind.No matter what I am Croat and i love my people and my country and will always fight for and voice my opinion in hopes for a better future. What a farce of a ruling. I’m sure all of the Mesicites, Pusicites, REKOMovci, and Paragitusovci (MUstase) are opening their champaign glasses but the fact remains that this is only halftime. In the meantime, as the Hero’s, who recieved criminal sentences in that Kafkaesque court set up by the very powers that quite openly lobbied for Milosevic and threatened Croatia with sanctions and bombs if Croatia didn’t accept “that the Serbs’ won”, defense teams reorganize for the second half (think Gotovina and Markac appeal) EVERY SINGLE Croatian community worldwide needs to purchase Lt. Col. Dr. Charles Schrader’s book, the Muslim-Croat Civil War in Bosnia Herzegovina 1992-1994 (http://www.amazon.com/The-Muslim-Croat-Civil-Central-Bosnia/dp/1585442615/ref=sr_1_1?ie=UTF8&qid=1369821066&sr=8-1&keywords=The+Muslim+Croat+Civil+War), and send it to their represenatives in their elective respective national governments, and to local high schools and universities. The truth is out there and it must be disseminated. Every lie and manipulation crapped today by the stooge in the red coat was debunked by Lt. Col. Dr. Schrader’s book. The war didn’t start in Prozor, where the ABiH commander issued a Warning Order for attack to take Prozor as was the case in Gornji Vakuf, and the Croats defended and counter-attacked. I would also add that it may be wise to send this documentary, In Broad Daylight, in either email or CD form: https://www.youtube.com/watch?v=M0NGcjcPUN0. I think sending the above mentioned materials to Catholic Church institutions and organizations and news magazines (ETWN itself) may be a good idea as well. I cannot offer much on these trials etc but theres a bigger picture or Power playing here. Its 20 yrs since I was in Bosnia and support the Croatians 100%. There was a lot of misinformation about the Muslims coming out to Western Europe. Its only recently since getting a reminder about Bosnia that Iv read up on events. Iv read lies etc. Where are all the Muslims ,Serbs that carried out murder on Bosnian Croats. ???? In every war all sides commit bad acts.But many Serbia and Bosnian Muslims committed horrific acts. I pray for true Justice for the Croats of Herceg-Bosna .